Automatic 3D acquisition devices (often called 3D scanners) can be employed to build highly accurate models of real 3D objects in a cost- and time-effective manner. The Visual Computing Group of CNUCE/IEI-CNR has experimented this technology in a particular application context: the acquisition of Cultural Heritage artefacts. Specific needs of this domain include: high accuracy, affordable costs of the scanning device and an improved usability of the data produced. 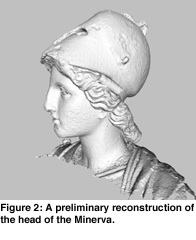 We present the characteristics of a new low-cost 3D scanner, based on structured light, and discuss the first results of its use in a project for the 3D acquisition of a bronze statue. Cultural Heritage is one of the few fields where classical 3D modelling tools result inadequate to model the shape of the objects or artefacts of interest. This is both due to the shape complexity of most artefacts (eg sculptures) and also to the high accuracy requested. The 3D model in many cases should not only look visually similar to the real object, but should also be very accurate, from a geometrical point of view. This is necessary for many applications such as the construction of 3D catalogues, the automatic reproduction of copies, the use of 3D models in the context of restoration plans, etc. 3D scanners can give a very precise reconstruction of the shape of a real object. This technology has been adopted in a number of recent cultural heritage projects. We can cite the Digital Michelangelo Project of Stanford University, the acquisition of Michelangelos Pietà in Florence by the IBM T.J. Watson Laboratory, or the acquisition of a section of the Coliseum in Rome by an Italian research team. 3D scanning technology has evolved in the last few years, but unfortunately not as fast as other electronic devices. One critical problem is the high cost of the scanning devices. A good scanner, able to produce data at the accuracy required by this class of applications, often costs more than 100K US$. This discourages the use of this technology in many Cultural Heritage institutions, especially in our national context. We have thus studied the design of low cost and medium quality optical scanners. The result is the design and prototypal construction of a new scanner based on consumer electronic technology. The architecture and features are described briefly here. ensure easy operability and flexibility. 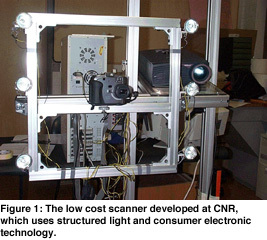 a digital still camera, to acquire images of the object under structured lighting. Both devices are driven by a software module running on a standard PC. This acquisition module produces a series of patterns (stripes with decreasing width, projected by the video projector) and drives the camera. Photos are taken to acquire: images of the distorted patterns (from which the geometry is reconstructed, producing a range map), and images of the object under different illumination conditions (from which the illumination-invariant color, or albedo, of the object surface is reconstructed). The color images by definition are self-recorded with range maps. an illumination-invariant colour texture (aligned with the corresponding range map) which represents the pictorial detail present on the acquired surface section. As usual in 3D scanning, complex objects are modelled via the acquisition of a set of partially overlapping range scans. Our proprietary software is used to register and merge all the range maps in a single triangulated mesh. The scanner is currently in use at the Soprintendenza Archeologica Toscana, in the restoration of the Minerva, a bronze statue of the Museo Archeologico of Florence. The entire statue was scanned in October 2000, producing 146 range maps and around 3000 images. We are currently processing this data, and a complete model will be ready at the end of 2000. Preliminary results are shown in Figure 2. This project has been developed in cooperation with the Centro di Restauro (Restoration Laboratory) of the Soprintendenza Archeologica Toscana in Florence, and with the financial support of the Progetto Finalizzato Beni Culturali of the Italian National Research Council and the Project RIS+ of the Tuscany Regional Government.